The last couple weeks have seen a marked increase in the number of EVE pilots expressing an interest in joining the New Order. And some provide me with intel. Everyone gives to the New Order what they can, from their own unique talents and abilities. Whether in New Order territories or out "on a range" in the untamed lands of highsec, our Agents are on the move. The redemptive power of the New Order is awesome. Kharmha was once a bitter enemy, chief among the rebels in Arvasaras earlier this year. She engaged in countless counter-bumping runs and even organized the local miners into coordinated fleets of suicide gankers against me. If Kharmha can see fit to join us, anyone can. 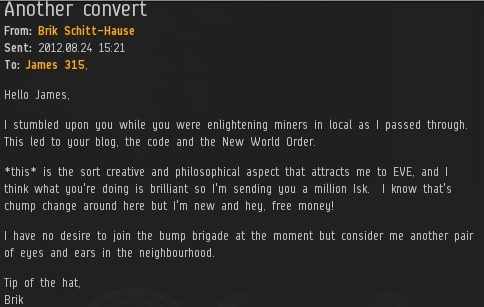 Checking my EVEmail is always a pleasure, as I am constantly reminded that no matter how many highsec miners oppose us, there are always more Agents out there waiting to be recruited. 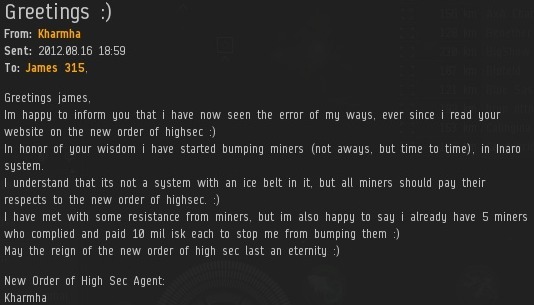 In no time at all, we will be the majority in highsec! You know what's boring? Mining. 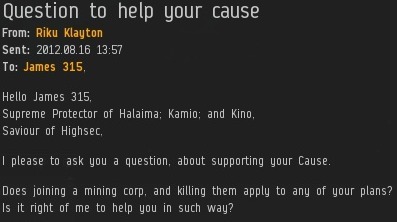 James 315 is providing the action that these high-sec miners so desperately need in their EVE gameplay. 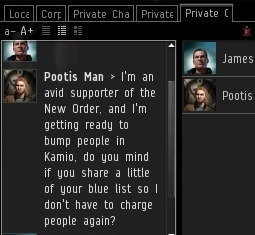 Is 10 million ISK truly too much to pay the man in order to be put on a "no-bump" list? I think I just found a pastime for my alt. Glory to the Supreme Protector!